A lot of people (including me before I really thought about it) think that it is difficult to cook for vegans. However, with a little forethought, and some minor adjustments, it isn’t actually that difficult. If you make it yourself, pastry is one of the easiest recipes to adapt to a vegan diet. When I was younger, and the world hadn’t woken up to the horrors of transfat, my mother used a special kind of margarine that as a solid at room temperature, and as a vivid yellow colour.I have no idea what was in it, and I am probably a bit afraid to find out! Nowadays you can get a number of olive and vegetable oil-based ones. These are not so yellow either. The following recipe is enough to give you the base for a large tart, or several smaller ones. I got 24 mince pies using this recipe. At this point, mix in the lemon zest. Then get some cold water in a jug – run the tap a little first to make sure that it is as cold as you can. Pour a little at a time into the flour and margarine mix and stir with your hands until it comes together to form a nice dough. At this point cover tightly with either cling film, greaseproof paper or foil. I never use cling film, so I just wrap my dough with whichever of the other two I have to hand. refrigerate for at least half an hour to allow the pastry to relax. If you don’t do this, the pastry will be difficult to work with, and may be too sticky or too short (crumbly). Use in any recipes that require pastry, but that would be otherwise suitable for vegans. Instead of greasing the tin you are going to bake it in with butter, just use a liberal coating of olive oil. Wherever you would use an egg/milk wash – i.e. any part of the finished product where the dough will be on display, such as pie crusts; or where you may need to add a liquid filling after a prebake, such as tart bases, then simply brush with water. 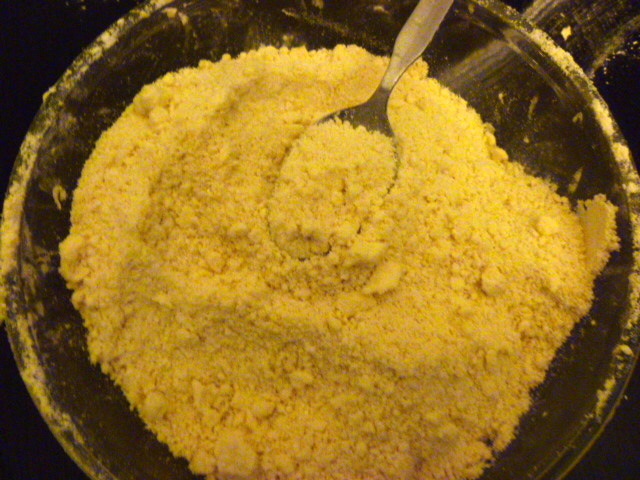 The resulting dough is quite short, but a bit denser in texture than all butter dough, and it is paler. My take on it is though, if you have one vegan guest, the other can eat vegetables, whereas your vegan friend cannot eat their food. This dough certainly passes muster for people who are used to eating animal products, so no need to cook special food for one or two. UPDATE: I have now tested this same pastry with ground almonds, and it makes the pastry richer, and has a lot of flavour. For the amounts given in this recipe, add an additional 75 g ground almonds with the flour, and work with the butter, as above. The savoury version is the same as this one, you just leave out the sugar. You can also flavour that with savoury spices, such as cumin or fennel seeds, that are appropriate to the filling that you will use. For the sweet or savoury versions, you could also use fruit juice (orange works well) for the sweet pastry or vegetable juice (such as beetroot or carrot juice – just be prepared that this will colour your dough) instead of water as the binding agent to ring in the changes and add a new dimension. I have just realised that you could make both this and the savoury version richer, and a little lighter if you add some ground almonds in. I will try and experiment with this, to see what the proportions are, and will add them to the recipe.